Dalton, who has never sold any work and has only given it away to friends, usually spends several months on each figure. 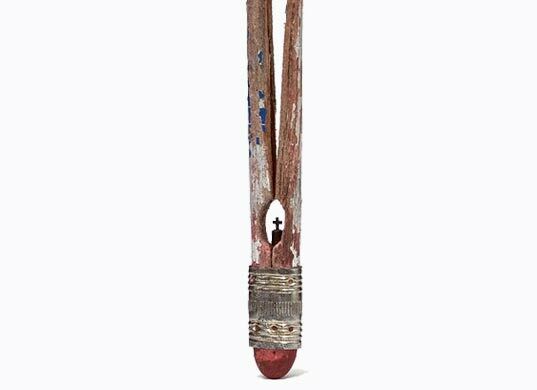 The longest piece, a pencil with interlinking chains, took him two and a half years, and he said it is so intricate that people often think it is actually two pencils. With all of that delicate detail it’s not surprising that some pieces just don’t make it to the end. For these unfortunate accidents Dalton has a box, he has cleverly named ‘the cemetery collection,’ where he keeps over 100 broken pieces. With work this impressive, it’s hard to believe that this is the first we are hearing of Dalton Ghetti. Here at Inhabitat we are delighted that someone finally brought it to our attention, and we certainly hope that there will be more to come in the future. This is trully art. An expression of art that reminds us of our happy days in school. May your hands, Dalton Ghetti, always be blessed. Art, as it is said, is in your hands. Congratulations, Paul Quintero (Zen Artist). 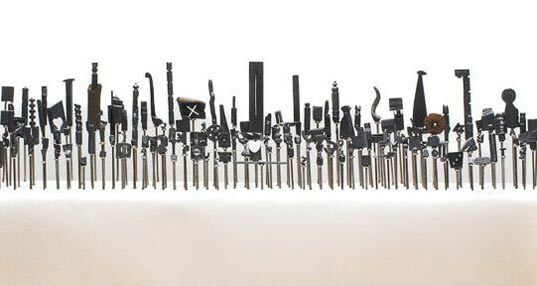 Ghetti, who is originally from Brazil, explores many different subjects. 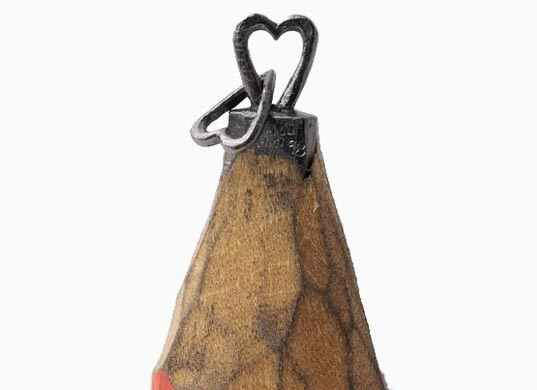 The image above is a section of a 26 pencil series - one pencil tip for each letter of the alphabet. He also refuses to work with a magnifying glass, and only uses three tools - a razor blade, sewing needle and sculpting knife. Dalton explains his process: "I use the sewing needle to make holes or dig into the graphite. 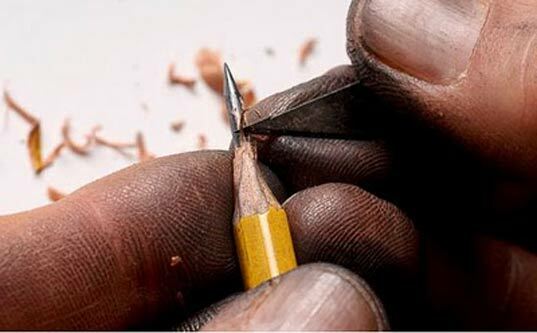 I scratch and create lines and turn the graphite around slowly in my hand"
You can see here how he has transformed this normal pencil tip in to a highly-detailed boot. Dalton, who has never sold any work and has only given it away to friends, usually spends several months on each figure. 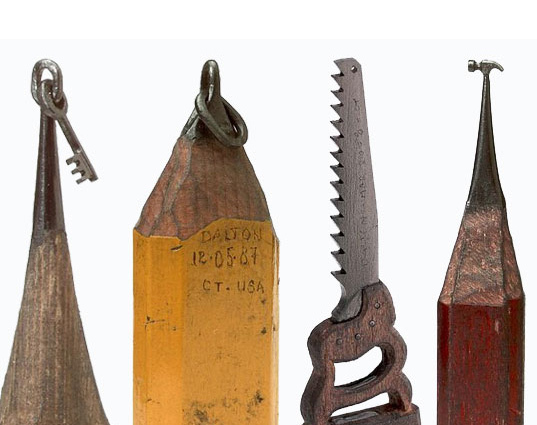 The longest piece – a pencil with interlinking chains – took him two and a half years, and he said it was so intricate that people often think it is actually two pencils. With all of that delicate detail it's not surprising that some pieces just don't make it to the end. For these unfortunate accidents Dalton has a box - cleverly named 'the cemetery collection' - where he keeps over 100 broken pieces. He also doesn't limit his work to just lead tips. Here he has carved into the wood and revealed a lovely dangling heart charm. Lucky for us this very cool carving of Elvis Presley wearing shades made it to the end. This piece was carved from the eraser end, which adds to the weight of the mini gravestone. Here a teeny mailbox and post. Ghetti, who is originally from Brazil, uses his little lead canvases to explore all types of subjects. 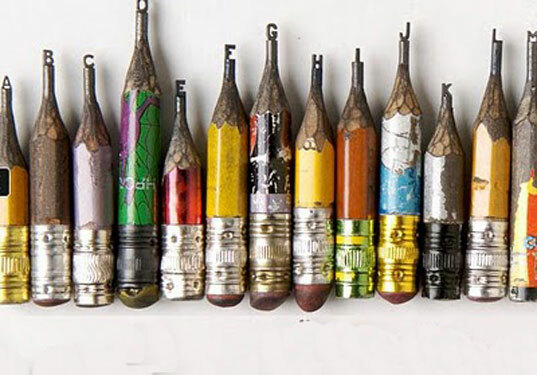 The image above depicts a part of his 26 pencil letter series - one pencil tip for each letter of the alphabet.